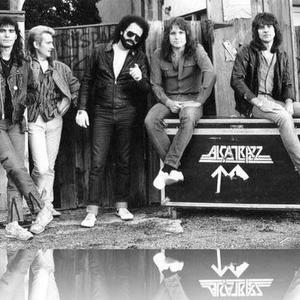 Alcatrazz was a heavy metal band formed in 1983 in Los Angeles by Graham Bonnet. The band's initial line-up consited of Graham Bonnet (vocals - ex-Rainbow / Michael Schenker Group), Yngwie J. Malmsteen (guitar - ex-Steeler), Gary Shea (bass - ex-New England), Jimmy Waldo (keyboards - also ex-New England) and Jan Uvena (drums - ex-Alice Cooper / Pointer Sisters). After recording the first two albums musical differences surfaced, and Malmsteen quit in 1985. Against the wishes of the band's management, he was replaced by Steve Vai who also left after recording the album Disturbing The Peace. The band's initial line-up consited of Graham Bonnet (vocals - ex-Rainbow / Michael Schenker Group), Yngwie J. Malmsteen (guitar - ex-Steeler), Gary Shea (bass - ex-New England), Jimmy Waldo (keyboards - also ex-New England) and Jan Uvena (drums - ex-Alice Cooper / Pointer Sisters). After recording the first two albums musical differences surfaced, and Malmsteen quit in 1985. Against the wishes of the band's management, he was replaced by Steve Vai who also left after recording the album Disturbing The Peace. The band brought in Danny Johnson to replace him, and recorded the album Dangerous Games before finally breaking up in 1987. Graham Bonnett described their sound as "The thinking man's heavy metal". Their most famous song is God Blessed Video, a somewhat comic song which makes fun of MTV. It can be heard on the fictional radio station V-Rock in the game Grand Theft Auto: Vice City.